Karl Lagerfeld returned to Hamburg to unveil his 15th Métiers d’Art collection for Chanel in the German city, where he was born. 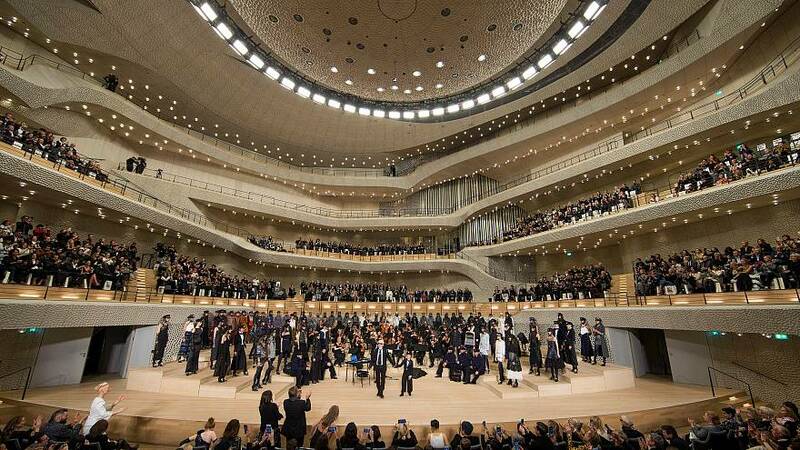 The show, which was a kind of homecoming from the label's Hamburg-born designer, Karl Lagerfeld, took place at the Elbphilharmonie, the city’s showstopping new concert hall, designed by contemporary starchitecture firm Herzog & de Meuron. The models were sharing the stage with a live orchestra. Among the models was Cindy Crawford's daughter Kaia Gerber, Victoria's Secret star Grace Elizabeth and Lagerfeld's 9-year-old godson Hudson Kroenig. The 84-year-old designer showcased a collection with a nautical theme. Models wore luxurious, turtleneck cable knit sweater dresses, coupled with thigh-high boots and sailor hats. The show began with nautical blues and moved to greys and muted tones in Chanel's distinctive style. Tilda Swinton, Lily-Rose Depp, Vanessa Paradis and Kristen Stewart were in the audience along with 1,420 clients, buyers, journalists and celebrities at the latest Chanel fashion show.